Concerto for violin and viola / Richard Mills. Instrumentation: Violin and viola solo, flute (doubling alto flute), oboe (doubling cor anglais), clarinet (doubling bass clarinet), bassoon (doubling contrabassoon), horn, piano, 1 percussion, strings (6.4.4.3.1). Dedication note: "For Dene & Irene with love"
This is a scan prepared from a hard copy in the composer's hand. 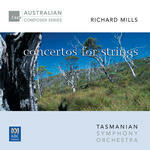 CD: Concertos for strings / Richard Mills.